Brazil's main opposition parties have made public a demand for the speaker of the lower house of Congress, Eduardo Cunha, to resign. He is being investigated for alleged corruption in a kick-back scheme at the state run oil company, Petrobras. A request for his resignation had already come from government supporters in Congress. Mr Cunha holds the power to allow impeachment proceedings against the Brazilian President, Dilma Rousseff. One of the most powerful members of the PMDB (the Party for the Democratic Movement of Brazil), part of the government coalition and hostile to Dilma Rousseff, Mr Cunha has been under investigation for months for allegedly having benefitted from the Petrobras corruption scheme. Image caption The political crisis has led to several large nationwide anti-government protests in Brazil with calls for the impeachment of President Rousseff. Prosecutors say firms bribed Petrobras executives to secure contracts and that some of this money was passed on to politicians in various parties. In July Mr Cunha left the government coalition after allegations by a jailed former consultant to Petrobras, Julio Camargo, that he had demanded a $5m (£3.2m) bribe to push through contracts for equipment. Mr Cunha has denied any involvement. As speaker of the lower house of the Brazilian congress, Eduardo Cunha has the power to reject or push forward the numerous requests by opposition parties to open a judicial process against President Rousseff. 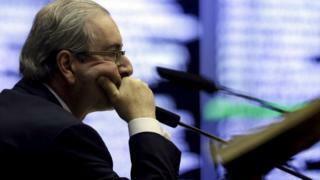 Earlier this week, a Brazilian audit court ruled that the president broke the law in managing last year's budget. The opposition says the ruling by the Federal Accounts Court - which reports to Congress - paves the way for impeachment proceedings against Ms Rousseff. Image caption There have also been pro-government protests in support of President Rousseff and against Eduardo Cunha amid calls for her impeachment. But Mr Cunha's standing was damaged last week when the Swiss fiscal authorities transferred to Brazil an investigation into Mr Cunha for alleged money laundering and corruption. A request for his resignation has also come from a group of MPs on the left, supporters of President Rousseff, who demanded Mr Cunha be investigated under the code of ethics of the lower house of Congress. Mr Cunha has denied he had bank accounts in Switzerland. He told local reporters he would not resign and was preparing his defence.